As the legend hangs up his boots tomorrow, yet another amazing chapter in the racing history will be closed, hopefully not forever. 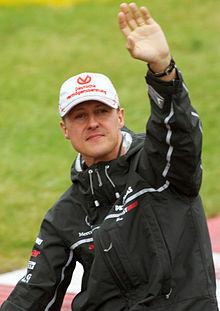 For many from this generation, very little about Schumacher’s greatness is known considering his last win came in the year 2006 and the second journey, according to what many would put it off as one great flop show, which btw.. I'm sure the Alonso's... Hamiltons... Vettels.. know for a fact that the story would have turned out different had he had a slightly better car. But having followed the sport closely since last 15 years and watched every single race, I can bet with anything that he has been one of the best drivers to have ever competed. Some say Ayrton Senna is the arguably the greatest of all time, well,to be honest, I have never seen Senna race although I have seen numerous videos to make myself believe that he is surely at par with Schumacher and can be pinned as the top drivers F1 has ever produced. 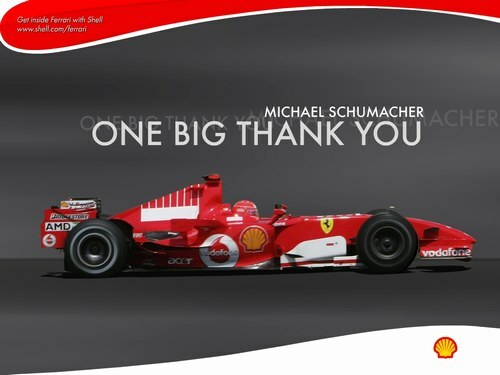 Michael has been a true inspiration when it comes to sheer determination and passion, the fact that at 43 years of age he challenged himself to driving a monster at well above 300kmph for roughly two hours literally getting thrown out by the Lateral G forces ,close to 5 G's sometimes and at the end losing fluids up to 3 kilos every other weekend and not to forget the fellow racers who are well below his age says a lot about this bloke!!. 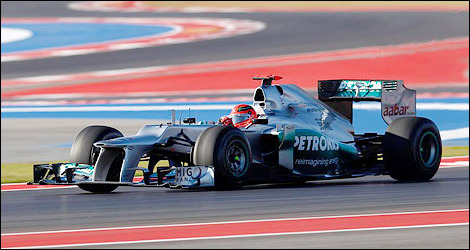 If not for some bad luck and power under those wheels of Mercedes powered car, 2012 surely would have turned out to be a different story. Having said that, watching him race every single lap this year has been a true joy, be it holding back Vettel or Hamilton or Raikkonen for many laps or putting up an amazing pole position show in Monaco or the Podium finish in Valencia, it has been a true delight. Facts never lie... so for someone with 308 race starts, 91 wins and 68 poles under his belt with seven drivers title is a record which will take some time before it gets broken. The fact that those 68 laps were the most perfect one time laps tells us about perfection in his driving and the skill to replicate the same performance on various circuits at different conditions. One must remember that back then, the drivers did not get multiple opportunities like today’s Qualifying format to set a quick time on the sheet. All they had was a trial lap followed by the final run, so to do that on 68 occasions is pretty impressive. I should also consider myself to be fortunate to have seen the dancing Ferrari on a rainy day. When it rains, no one can even bother to get anywhere near him. It’s like he has a sixth sense of where the actual grip is available and uses every single mm of it and thereby pushing the cars to the limit. These were done in not cars of today’s F1 wherein monitoring every single detail is very easy and the safety of the driver and the car has a whole has taken new heights, but in those sheer monsters of 3,5 V8 and a 3L V10 in which he won his titles. These cars were also not so easy to drive unlike the ones of today where most of the stuff can be altered by remote access. Five of those seven titles have come in a great fashion. If you look back at the statistics, the points difference b/w him and the second driver is almost 50% higher. This was the dominance, the dominance which was so powerful that they went on to win the constructors for five years in a row. 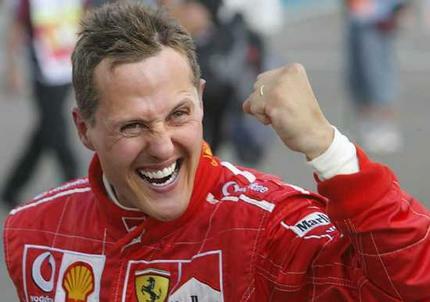 The strategy of Ferrari crew has also played a major role in his success. The brains of Ross brawn and Jean Todt, the amazing fuel and tyre strategies, pit stops of course, everything was so damn perfect. Not to forget the belief they had in their driver to make his own decisions while on the track. I remember on numerous occasions he turned down the radio call of coming into pits and took his own decisions. One of the best of all races has to be the Interlagos 2006 where he started 8th on the grid, made up two places before getting a puncture from Fisichella to drop all the way back in the grid. The gap was so much that you could notice Massa(who was leading the race) a few seconds behind him. Just when everyone thought that his then last race turned out to be a disaster, he surprised everyone with a fourth place finish asserting his position as one of the best to have ever played this sport. 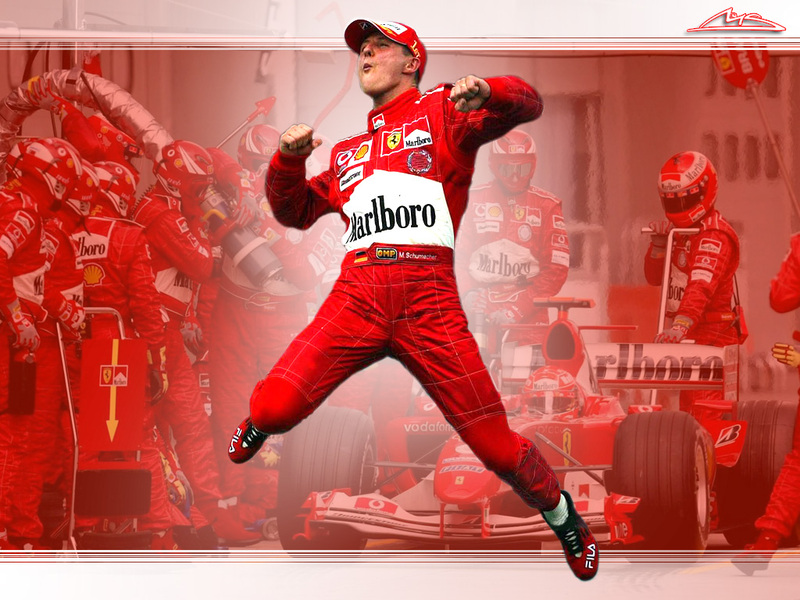 Most of the laps from then, went on to be the fastest laps of the race, after every single lap, a flash would pop up on tv screen saying 'Fastest Lap M Schumacher' .. finally finishing a credible 4th place. 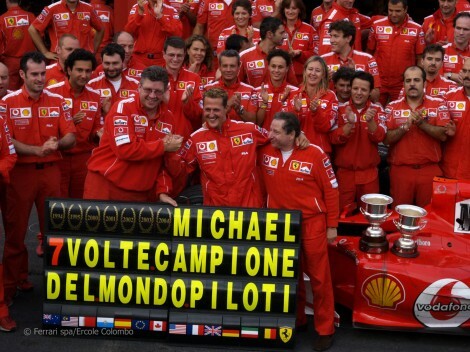 If not for the first Ferrari engine failure in 5 years in Suzuka GP 2006, he would have made his title tally to Eight. Records held by the God !! It will surely take sometime to get used to not seeing MSC again on the starting grid, millions of fans will miss him irresective of him starting last or first, bad or good car..!! 1) The Ecstatic podium jump, although been a while now.. still have fresh memories of the same. 2) Michael, The Rain Master.... On any given rainy day, expect him to pull a rabbit out of the hat. 3) The Commitment to win, whatever it takes.